Biking is one of those sports where every element plays a crucial role. 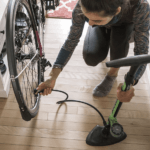 Whether you are considering the smallest handle grip or the entire bike, everything needs special attention. That alone can make the whole experience complete. In this context, the bike saddle is also very important. You sit on it for an extended period and an uncomfortable seat can really ruin the whole experience for you. Therefore the search for the best mountain bike saddle is, in many ways, as important as the bike itself. A lot of times, the readymade saddle on the bikes may not be as comfortable as you prefer. There are also chances that the cushioning is much less effective than what you wanted. It is also possible that you may like a much better degree of cushioning than the standard arrangement. The best MTB saddle is decidedly what works best for you. Individual choices can differ greatly, and there can be a range of features that you may be looking into. But comfort is the primary concern for any serious biker. After all, that alone decides how long or how fast they are able to bike forth. It is for this reason that every biker has their own set of favorites. 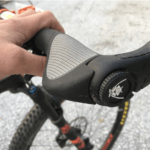 I agree looking for the best mountain bike saddle can be challenging but at the same time, let me share a simple trick. 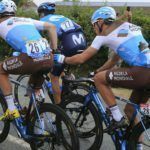 Pay close attention to your current bike, think about all the elements you do not like about it and make a mental note. The best saddle for you is the one that eliminates the maximum of your problems. 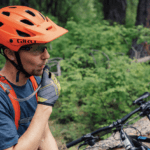 Here is a quick guide on some of the best mountain bike saddle available now. We have rated these products on the basis of several factors to offer the most comprehensive choices for you. 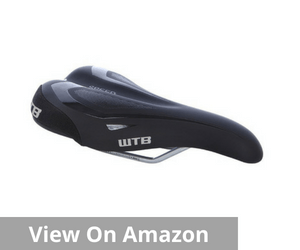 If you are looking for a standard no-frills quality mountain bike saddle that is also easy on the pocket, you have reached the right spot. Per se, there is nothing exceptionally great about the WTB Speed Comp, but on the whole, it is a comprehensive package. Its understated charm stands out in the way this has been the chosen brand by a wide number of serious and regular bikers globally. This is an extremely versatile bike that can perform well on the mountain roads as well as the roads. The location does not matter in this case. The saddle is designed in a way that it tends to absorb the maximum amount of pressure, providing much-needed relief to your hips and prostate region. As a result, this is one of the best mountain bike saddles that you can lay your hands on. This is made of dual compound Soft-Shell base. This means that the shell is sturdy, but at the same time, it is not wobbly or sinks too much. There is ample padding on the key structure, and this makes it capable of adjusting to any type of body shape and body weight. The steel rails and the synthetic saddle cover make it very affordable, but at the same time, the high-grade materials improve the durability of these elements to a large extent. This is the ultimate cross between quality and affordability. 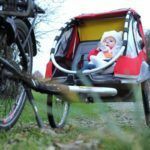 It can be slightly difficult rising in dam conditions as the material of the saddle cover tends to stick to the inner thighs. This can impede speed and agility to an extent. 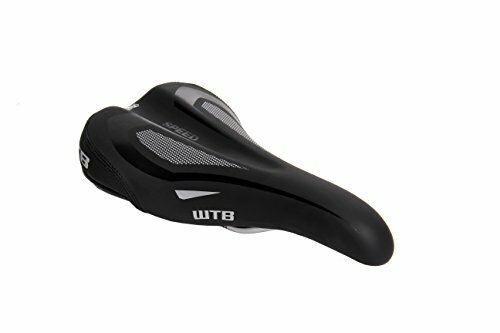 If you are the type who is looking for a soft and comfortable seat, this is one of the best MTB saddles to zero in on. The Bikeroo Padded MTB Saddle is known for the superior comfort that it’s all products deliver. These are not just well cut and functional saddles, but these are created to provide an excellent degree of comfort and convenience. With shock absorbers in place, this is one of the best mountain saddles one can use for long distances. It supports the body both anatomically and ergonomically. As a result, this one eliminates the scope of bone pain to a large extent. It redistributes the pressure on the hip quite effectively, and that is what makes it an extremely comfortable and compact alternative. Its versatility and the design brilliance that enables easy mount has won this saddle millions of admirers worldwide. 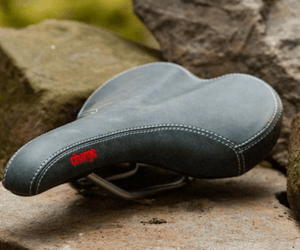 Whether you use it for the normal concrete trails or the mountain terrain or even indoor cycling options, this is one saddle that will never disappoint you in any situation. The company’s commitment to quality is well borne out by the 100% money back guarantee they offer. This is one of the best known ergonomically designed saddles and easily finds mention in any list of the best MTB saddles. By the time ergonomically, I am referring towards superior knowledge application that is put to use. 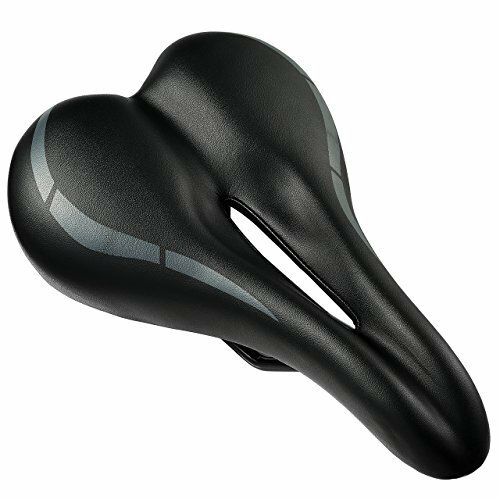 The rounded rear of the saddle provides comfortable support to your buttocks and enables easy shock absorption. It also reduces the relative pressure on the prostate and the ischial region. Along with the definitive ergonomic design, it is also known for the high level of elasticity. 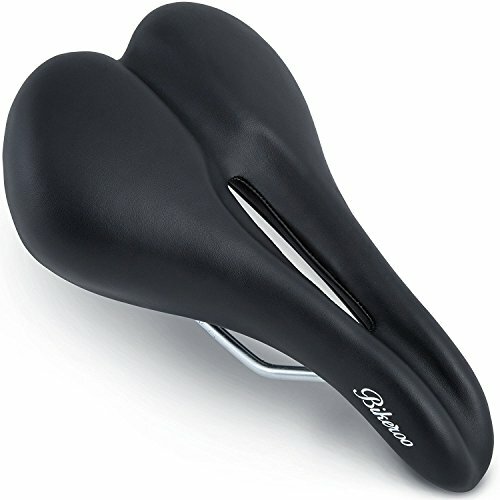 The makers of this saddle have achieved this unique balance by using a combination of high-grade steel, PU leather, and abrasion resistant soft sponge. The pressure on the hip too comes down significantly as result of this elasticity. What adds to the ratings and popularity is the fact that this is a rather simple construct. Assembling it is literally child’s play with a strong emphasis on comfort. Moreover, the anti-slip material used grips the ground quite well. So you can enjoy the ride quite comfortably without having to worry about any health or security hazard whatsoever. As a result, you can also maintain superior ride quality. Hollow core and the deep center with grooves makes the saddle relative a high-end option on the performance basis. Selected users pointed out that the nose of the seat is very wide and tends to rub against the thighs. But this, I feel, is more of a body-specific issue. This experience may differ from person to person at every stage. This one is amongst the flattest of saddles that you ever set eyes on. The Fabric Scoop Elite is shallow and as flat as you can imagine a bike saddle to be. Made of a very flexible variant of nylon shell along with chromoly rails ensure that you are comfortable the entire time. Additionally, they are also extremely sturdy and durable. This is one of the best mountain bike saddles in this price point. It comes equipped with weather-proof microcover that is again very durable. It can stand against all odds for a very long period. The fabric of this saddle cover needs special mention. You have already heard how this fabric decides the hot brands from not so hot ones in the market. The versatility of the scoop is the other key positive about it. It is made to adjust to myriad of opportunities easily. So you have the same bike that serves well on the roads and also the mountain trail. It is built very sturdily and involves a three-part saddle building process. It can also help you adapt better as there are different shapes to address the needs of every body type and fit them well. The chromoly rails make this saddle even more lightweight, but at the same time, it does not compromise on the solid structure and the extremely durable interface. 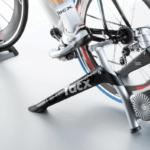 After all, this is what enables that saddle to service a wide range of users. It is also weather-proof, so the risk of the seat getting wet or the fabric becoming damp is much lesser. Select users have however mentioned that continuous use sometimes leads to creaking noise. But that apart this is a satisfactory bike saddle. 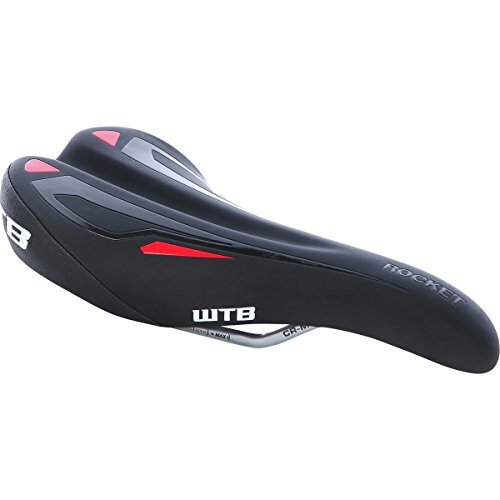 If you are looking for a pain-free bike saddle, the WTB Rocket counts amongst the best MTB saddle. It is designed for excellence and convenience, and the superior user comfort is one of the hallmarks of excellence for this saddle. 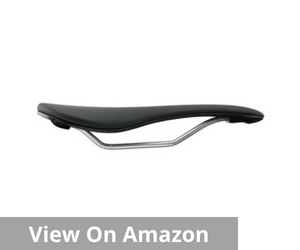 In fact, this is an extremely versatile saddle that works brilliantly both on roads and also mountain bikes. 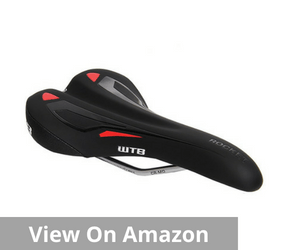 The bottom line is that this saddle helps the biker adjust to any type terrain with relative ease. Its superior design and performance ability can be well gauged by the fact that this is the saddle of choice for many biking legends known for their exemplary performance. But, in the name of a superior performance, this is the type of bike that does not force you to pay through your nose. 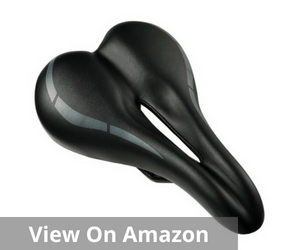 On the contrary, this is an extremely affordable bike saddle and represents the perfect combination of a value buy. It helps you in experiencing maximum comfort at the minimum rate without compromising on any of the crucial features. 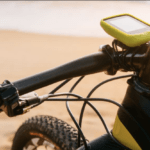 As a result, this is also an extremely durable and sturdy bike that promises reliable service irrespective of the terrain that you may be riding on. Once you have adjusted it properly, it is hard not to like it. In many ways, the saddle appears to grow on you. The quality of the product can be well judged by the fact there are no ‘1-star’ ratings and very few ‘2-star’ ones either. However that said, select users have found it a little harder. But let us understand that this is an extremely subjective matter and the best way to look for them is to try it out before buying. You can, therefore, understand that setting for the best mountain bike saddle is not an easy job at all. But often the problem is just like there are innumerable options and making a choice becomes difficult. Here is a look at some of the most important elements that you must always consider before choosing a bike saddle. 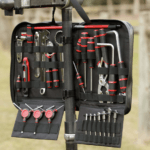 These don’t just make your ride comfortable, but also prevent any long-term injuries or possible difficulties arising from sitting on an uncomfortable saddle. The shell is one of the most important elements when you are looking for the best MTB saddle. These shells come in various shapes and sizes and essentially, this is what makes the base of the saddle. So, details like how springy it or how stable it is depends directly on the quality of the shell. Mostly these shells are made of nylon, but in some cases, they also have carbon reinforcements. There are some very expensive ones that are completely made of carbon. Individual choices can differ but look for which of these suit your comfort and budget best. Gone are the days when saddle covers were generally always made of leather. Even now you have lots of really expensive saddles made of pure leather. But on an average, most saddle covers are synthetic now. It works both ways. They are both durable and also low-cost options. Often the genuine leather can spike-up the overall price. However, if you are looking for a more budget buy, synthetic covers are best bets. Just make sure that there is no chaffing in the reinforcing panels, and at the same time, it is sturdy enough to handle the usual wear and tear. In terms of comfort and convenience, the padding is the most crucial element. In the absence of proper padding, the seats can be uncomfortable, and if you overdo it, they tend to be wobbly. In fact, you get padding in a wide range of densities depending on how firm or how soft the saddle seat you prefer. But remember one thing, a very soft saddle may work well initially, but over the longer term, they will increase the heat and discomfort. So it is better to go for a slightly firm variant. You will notice that many mountain bike saddles have small cutouts or grooves in the center. This is created specially to distribute the pressure. That means the driver does not feel continuous pain or pressure on any particular area. That essentially means this improves the comfort element when riding for long hours. The grooves also cut down the heat generated close to these sensitive nerve endings and vein areas. Not only does it reduce the chance of any abrasion but at the same time, it cuts down the scope of fatigue while biking for extended hours. The rails are the other key elements that distinguish the best mountain bike saddle from the not so great ones. These rails are the bars that are used to clamp the saddle to the seat post on the bike. The cheaper variants use steel alloys while titanium or carbon ones are used in the slightly more expensive options. 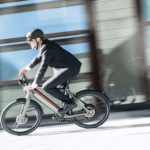 The advantage with the carbon or titanium ones is that it is very lightweight and makes the seat rather sturdy and firm. On the contrary, the steel ones are relatively healthy. In case proper alloys are not used, there can also be the risk of rusting in humid areas. 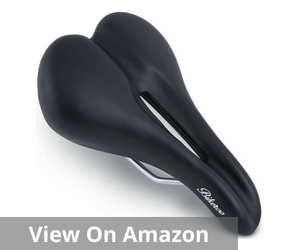 Therefore the choice of a great bike saddle has to take several factors into consideration. Though we understand that comfort is crucial here, many elements work together to create their sense of ultimate comfort. So, it is pointless to look at any particular factor in isolation. The best bet is to take a comprehensive view and look for ones that fit into the entire gamut of pre-conditions and triggers that determine quality. These apart, many factors aid comfort and quality but individual preferences matter. 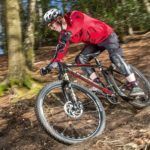 Therefore, the best MTB saddle is the one that has a maximum of these factors ticked.